← TOP 5 REASONS TO VISIT ISRAEL WITH US IN 2015! Have you ever stopped to consider the things that God cannot do? Let me suggest a few. The first thing He can’t do is lie. Number 23:19 explains: “God is not man, that He should lie, or a son of man, that He should change His mind. Has He said, and will He not do it? Or has He spoken, and will He not fulfill it?” God cannot lie, for that would be a violation of His own holy character. That’s why many of the questions posed by skeptics are often just plain silly, like this. Have you ever come across this one? 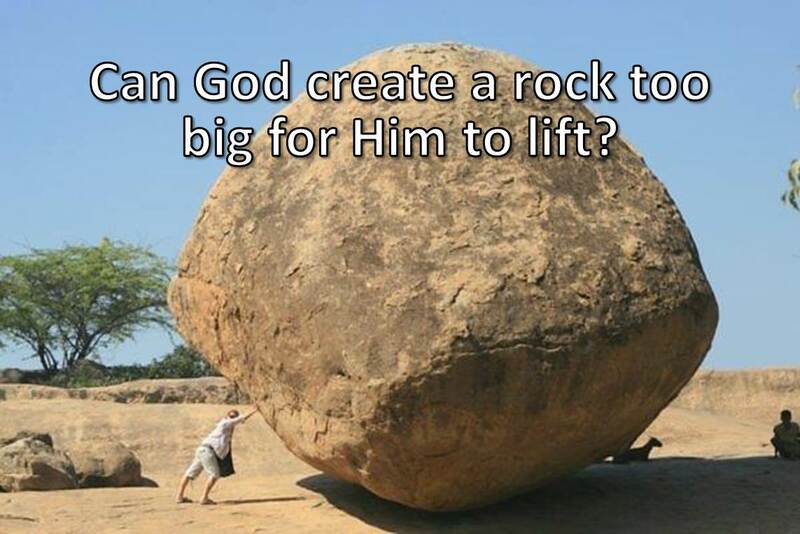 They ask, “If your God is all-powerful and able to do anything, then let’s see Him create a rock that is too big for Him to lift!” But then that’s just double talk, for what they’re trying to do is to pit God’s creative power against His power to do miracles, asking Him to violate His own Almighty character, something He said He will not and cannot ever do. God cannot lie, nor will He ever contradict His own holy character. Now let’s talk about ourselves. Is there anything we can’t do if we put our minds to it? “Absolutely not!” the New Agers, the humanists, and the followers of the cults will tell you. “You can do anything if you just learn to believe in yourself!” Fools! The list of what we can’t do is absolutely endless. But the one that tops the list is the one before us tonight—the impossibility of being born again! Let me remind you, as we get started, where we left off last week. We were in Jerusalem following the Passover where Jesus performed a countless number of miracles for over a year, proving that He’s God with hundreds of people coming up to Him and saying, “I believe in you, Jesus, I believe you’re the Messiah!” We saw that in John 2:23 – “Now when He was in Jerusalem at the Passover Feast, many were believing (The word is pisteuo meaning to believe in someone.) in His name when they saw the signs He was doing. But verse 24 adds, “Jesus, on His part, was not entrusting Himself to them.” (That’s the same word pisteuo.) In other words, they were believing in Jesus, but He wasn’t believing in them! Why not? John says, “He did not need anyone to testify concerning man, for He Himself knew what was in man.” And what He knows us isn’t good! For as the Bible says about us in many places, “In me, that is, in my flesh dwells no good thing.” The only good thing about you, if your faith is genuine, is that Jesus now lives in your heart and has changed your fundamental nature. That brings us to chapter 3 where we meet a man from Jerusalem who has seen the miracles of Jesus and concluded, “This is a man sent by God!” By the way, do you think that’s a coincidence, that John immediately introduces us to someone who pictures what he’s just told us at the end of chapter 2? Of course not! John is a fisherman, and if anyone knows how to tell a story, it’s a fisherman. Except in this case, it’s true and inspired by the Holy Spirit who, Jesus said, is the Spirit of truth, which means whatever you find in this Book, you can trust. Unfortunately for this man, he isn’t a true believer because, he doesn’t yet have the right kind of belief. That’s something John warns us again and again in this book, that there is a belief which is not a belief because it’s a belief that’s superficial, self-serving, and stubbornly refuses to give Jesus the glory He deserves as God the Son. 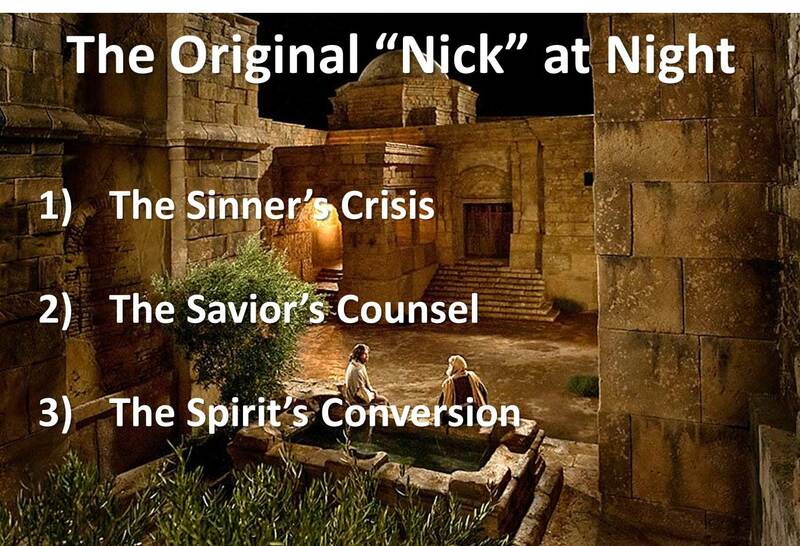 Open your Bible with me, then, to John chapter 3 where we’re going to meet “The Original Nick at Night,” and therein discover both what it means and why it’s imperative to be “born from above.” My outline for our study has 3 parts: the Sinner’s Crisis, the Savior’s Counsel, and the Spirit’s Conversion. 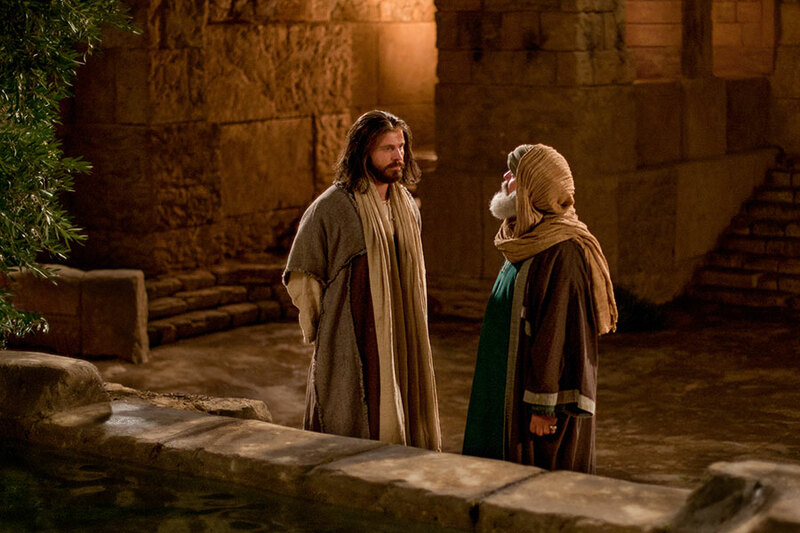 1) He himself was a Pharisee. The word means “separated one.” These were the ultra-conservative, Bible believers of Israel who interpreted the Bible literally. They believed in angels, devils, miracles, the six days of creation, heaven, hell – all of which made Nicodemus anxious because he knew he wasn’t ready to stand before God in judgment. They were also conservative in lifestyle. You know the ultra-orthodox, Hasidic branch of Judaism? These were its founders, and they were absolutely rabid about keeping the Law, not only priding themselves in the fact that they kept all 613 commandments of the Old Testament (Remember the rich young ruler? “All these things I have kept from my youth!”), but they had also come up with over a thousand laws or mitzvot of their own, just to make sure they never came close to crossing over the line. For example, one thing a Pharisees would never do, or let his wife do, was look in a mirror on the Sabbath. Why not? Because she might find a gray hair and be tempted to pluck it, which was considered working on the Sabbath! On the other hand, a Pharisee could eat an egg laid on the Sabbath, but only if he killed the hen that laid it for working on the Sabbath. That’s how ridiculous it got. And all for nothing! Because as holy as they thought they were and seemed to be on the surface (We’re good at fooling ourselves and others, aren’t we? ), Jesus called them whitewashed tombs who looked beautiful on the outside, but on the inside were full of dead men’s bones and every kind of uncleanness. 2) He was a ruler of the Jews, meaning he was a member of the Sanhedrin, the Jewish High Council made up of its 70 most powerful leaders, plus the high priest, and comprising what was in essence the Congress and Supreme Court of Israel—which means Nicodemus was a very powerful man. 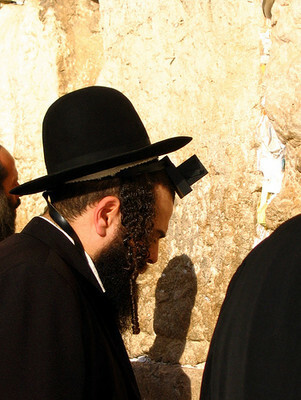 Church tradition says he was also one of the three wealthiest men in Jerusalem at the time. 3) He was, according to verse 10, not just a teacher, but “the teacher of Israel.” Jesus uses the definite article indicating that of all the rabbis in Israel at the time, Nicodemus was the best and brightest of them. As such, he would have been like a walking Bible dictionary, able to quote the entire Old Testament by memory. That means when talking to him, all Jesus had to do was mention a topic and every verse on that subject would have immediately come to his mind. But above all things, he was a lost and desperate soul. After all, what do you do when you’ve spent your whole life scaling the ladder of self-righteousness and reached the pinnacle of your religion only to discover that it’s all been in vain? The only thing left to do is to turn to Jesus! So that’s what he did. He comes to Jesus lost, fearful, and wondering how to be saved. That’s the sinner’s crisis. Now look with me at the Savior’s counsel for sinners like you and me. 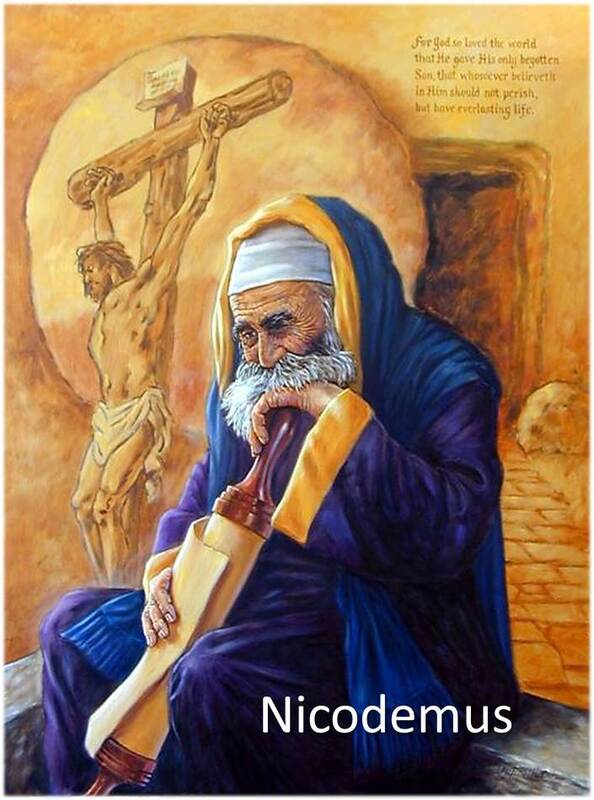 Nicodemus says to Jesus, “Rabbi” meaning “teacher.” That was something Nicodemus was called every day of his life, for of all the teachers in Israel, he was the most respected. But now his soul is in trouble and he’s desperate for help! So he turns to a Teacher who surpasses him in every way saying, “Rabbi, we know that You’re a teacher from God, for no one can do these signs that You do unless God is with him.” How does Jesus answer? “Truly, truly, I say to you, unless one is born again, he cannot see the kingdom of God.” Sounds like a non sequitur, doesn’t it? In other words, how did what you said have anything to do with what I said? Ever had a conversation like that with somebody? But that isn’t how Nicodemus takes it. He realizes that what Jesus has just done is read his mind. He knows his guilt and his fears, and He knows yours too! Nicodemus has heard Jesus preach several times by now. So he’s aware how superficial his righteousness is. That’s something every hypocrite knows in his heart. He knows he’s a hypocrite. And the Pharisees were hypocrites—every one of them! How can I say that? Because that’s what Jesus said 5 times in Matthew 23 alone: “Woe to you, scribes and Pharisees, hypocrites!” Then He adds, “You travel over land and sea to make one convert, and when you finally win him, you make him twice as much a son of hell as yourselves!” Nicodemus was a Pharisee, a hypocrite, and a son of hell! And he was well aware of it! So what does Jesus do? He ignores the compliment and goes straight to the heart of his problem. “Truly, truly, I say to you.” That means He’s about to correct a false teaching Nicodemus was guilty of. What false teaching was that? The false teaching of apostate Judaism that you can earn God’s favor by your good works and self-righteousness! Jesus corrects that saying to him not once, but 5 times in 8 verses, “You must be born again!” Jimmy Carter made that a household term when he ran for president and claimed to be a born again Christian. Since then it has been misapplied to everything from born-again athletic careers to second-hand books and used cars. So here’s a suggestion when talking to someone about your faith. Use the second, not the first meaning, of the word. What do I mean? The word anothen can actually be translated two different ways—“born again” or “born from above.” And the second meaning is what Jesus is really saying – without receiving new life from above, you’ll never see the Kingdom of God. 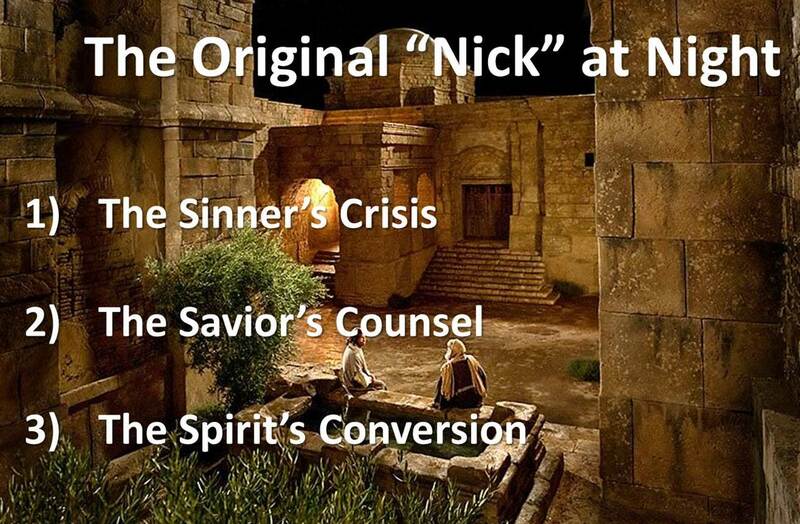 The analogy of birth is also the best way to explain salvation to someone like Nicodemus who is self-righteous. Because just as an unborn baby is helpless to contribute anything to his own birth, in the same way you and I are helpless to contribute anything to our salvation. Religion is useless, no matter what group you belong to or how sincere you are, because everything you do is corrupted by your sinful nature. Isaiah 64:6 says, “We are all like an unclean thing, and all our righteousness is like a filthy rag.” Consequently, what you need if we want to enter God’s Kingdom is the new life which only Jesus can give you. Remember what John said in John 1:12? “But as many as received Him, to them He gave the power to become children of God, even to those who believe in His name, who were born not of blood, nor of the will of the flesh, nor of the will of man, but of God.” So don’t waste your time looking for any books telling you how to be born again. Sometimes you’ll hear that. Here are four steps to being born again. But that contradicts the very thing Jesus is teaching us here. His point is that there’s absolutely nothing you can do to save yourself, except to throw yourself on His mercy and ask Him to give you new life, and He will. Nicodemus gets that better than most Bible-believing Christians. He knows he’s helpless to save himself. But still, like most of us, he’s thinking, “If I understood all of this just a little bit better, it’d be so much easier to believe.” You can see that in verse 9 where he wonders, “How can these things be?” But that’s not how it works. Understanding doesn’t come before believing. On the contrary, there are many things about Jesus you’ll never understand until you believe in Him. So Jesus corrects him again, “Are you the teacher of Israel, and yet you do not understand these things?” You see in his case, his lack of understanding was due to his lack of belief, not a lack of information! After all, this was the teacher of Israel who had the entire Old Testament hidden in his heart! Read on and you’ll see that yourself. Jesus continues, “Truly, truly, I say to you, we speak of what we know and bear witness to what we have seen, but you do not receive our testimony. (Remember receiving is another word for believing!) If I have told you earthly things, and you do not believe, (Unbelief was his problem!) how can you believe if I tell you heavenly things?” His problem is he’s an unbeliever – his mind blinded by the devil, his will enslaved to sin, and his affections corrupted by the world. So he’s going to need help if he’s to believe. That’s the point of verse 4. “How can a man be born when he’s old? He can’t enter a second time into his mother’s womb and be born, can he?” Nicodemus isn’t dumb. Nor is he challenging Jesus at this point. Then what’s he doing? He’s asking for a clue, which Jesus graciously proceeds to give him. 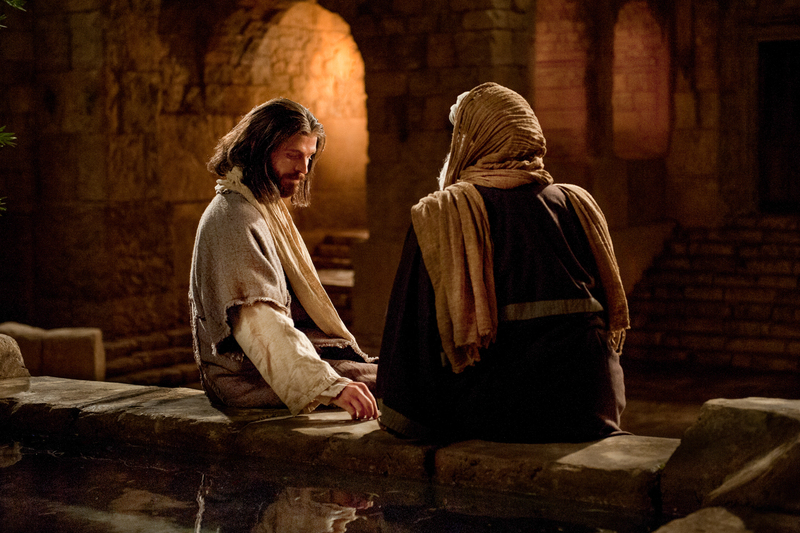 We’ve seen the sinner’s crisis and the Savior’s counsel. Now notice the Spirit’s conversion. The first clue Jesus gives him is in verse 5: “Unless one is born of water and the Spirit, he cannot enter into the kingdom of God. That which is born of the flesh is flesh and that which is born of the Spirit is spirit. Do not be amazed that I said to you, ‘You must be born again.’” Spirit, of course, refers to the Holy Spirit. But what does it mean to “born of water”? Some say it refers to baptism. But how can that be true? Baptism does not save us. Baptism is a testimony that we’ve already been born from above. Others say it refers to the waters of birth. But that can’t be right either. 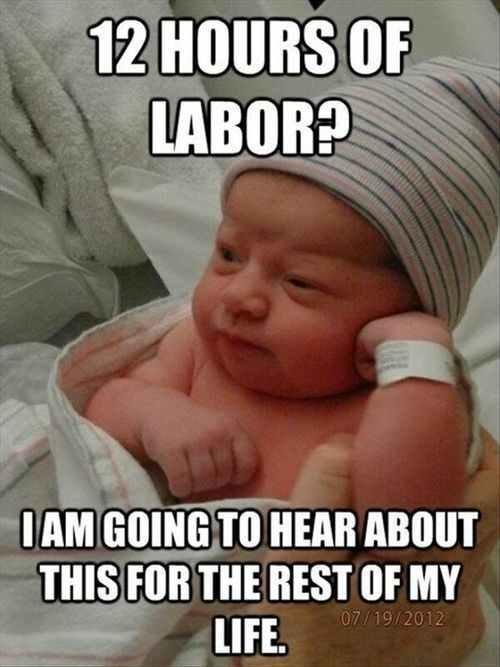 First century Jews weren’t yet aware of the role amniotic fluid plays in the birth of a child. Nor did Nicodemus have to be told that you have to be born the first time before he could be born the second time. So what was Jesus referring to? Remember Nicodemus was an Old Testament scholar whose mind would have immediately tracked with Jesus, taking him to passages like Ezekiel 36 where God promised His people, “I will…sprinkle clean water on you, and you shall be clean from all your uncleanness…and I will give you a new heart and…put my Spirit within you and make you walk in My statutes and be careful to obey My rules.” Jesus was talking about the New Covenant that was about to come true in His blood, a promise that Nicodemus had known since he was a boy. 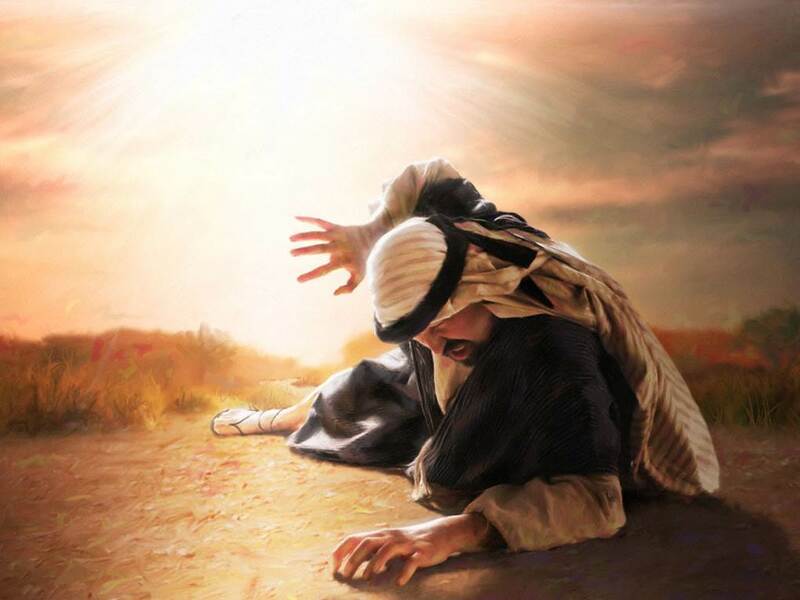 But like all the religious leaders of Israel, he was an apostate Jew who, because he hadn’t experienced the miracle of new life himself, had given up on God’s promise. And once you do that, what do you next? You reject what the Bible says about sin and that we aren’t all “good kids” with good hearts. The fact is there’s not one good person among us. 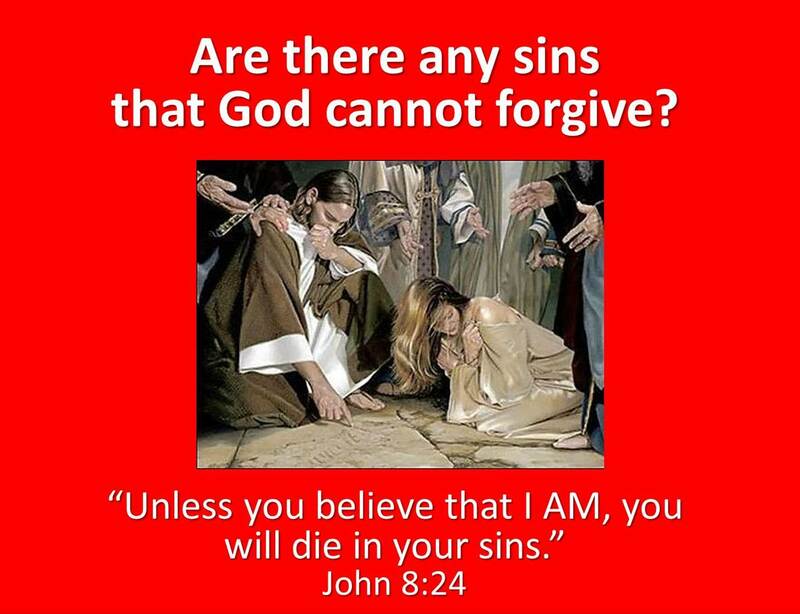 Because if you admit that, that we all deserve eternal punishment in hell, how do you cope with the fear? Answer: You ask God for the gift of faith to believe His promises of new life and forgiveness! The second clue is in verse 8. Jesus continues, “The wind blows where it wishes, and you hear its sound, but you do not know where it comes from or where it goes. So it is with everyone who is born of the Spirit.” Ever done that? Stood outside surrounded by the beauty of God’s creation and heard His wind roaring through the trees? I did that the other night. I was outside watering the flowers when I suddenly heard and felt a cool summer’s breeze blowing past me. And I thought, “What a perfect way to describe the power and refreshment of the Holy Spirit!” I didn’t know where it came from or where it was going. Nor could I control it! 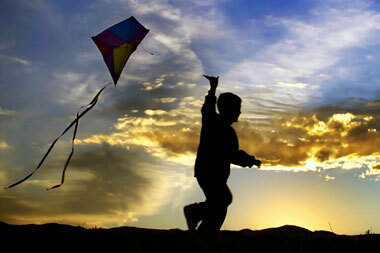 Ever tried to get the wind to blow when you want to fly a kite? But I felt the results of it! And you can see the results when the Holy Spirit touches someone’s life, for what happens? Just as the dead man heard Jesus shout, “Lazarus, come forth!” I heard a voice – not audibly, but just as real – saying, “Gary, believe!” And for the first time I believed in Jesus, and my spirit, which had been dead for so long, came to life, and I’ve been following Him ever since. But what about Nicodemus? Was he ever born from above? John doesn’t say. He fades from the scene in verse 21, and we don’t hear from him again until chapter 7 where his colleagues on the Council decide that Jesus has to go. So he takes issue with them on a point of Law. John 7:50—“Nicodemus, who had gone to Him before and was one of them, said to them, ‘Does our law judge a man without first giving him a hearing and learning what He does?’” So he hasn’t taken a public stand for Him yet, but I’m feeling better about him. Aren’t you? And the last we hear of him is John 19:38 following the crucifixion. 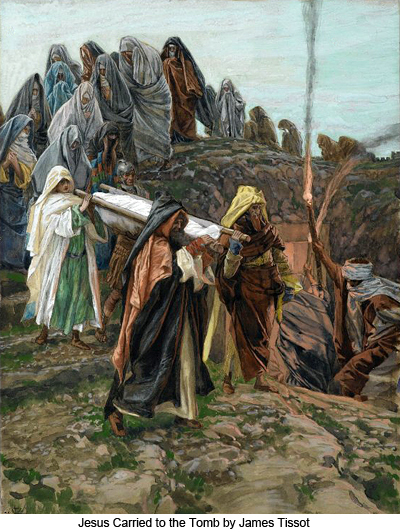 He and a rich friend by the name of Joseph of Arimathea summon up the courage to ask Pilate for the body of Jesus, so they can prepare it for burial and lay it in a new tomb that belongs to Joseph. And now I’m starting to love this guy because of his love and loyalty to Jesus! But that’s all the Bible says about him. Thankfully, church tradition fills in the rest of the details. 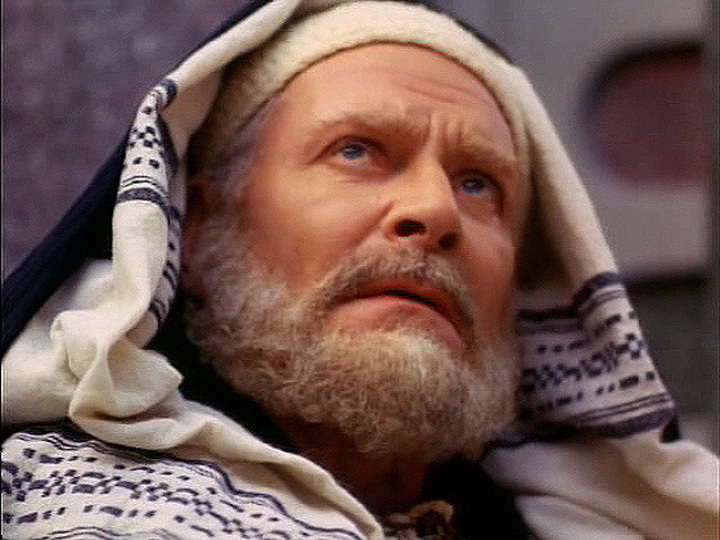 It reports, for example, that Nicodemus was the only person who stood up for Jesus at His trial, that he was baptized after the Resurrection by Peter and John, and that his preaching of Christ was so powerful that the Sanhedrin he served removed him from his position as teacher, confiscated his property, and banished him from Israel subjecting his wife and children to abject poverty. His daughter was so poor it’s said she had to dig through the dung piles to find a few pieces of grain to eat. A rabbi saw her doing so and took pity on her. “Who are you?” he asked. “I am the daughter of Nicodemus.” “Whatever happened to him?” he asked. “He became a follower of Jesus and was banished from Israel.” So the rabbi refused to help her. And as for Nicodemus himself, he became one of the first martyrs of the church, beaten to death by a mob for preaching in the name of Jesus. That’s the story of Nick at night. He had everything and then gave up everything to gain what the world can never take away. So even though John doesn’t give us the details, we have our answer: His sins were washed away and he was given new life from above. For so it is with everyone who is born of the Spirit. This entry was posted in Uncategorized and tagged Apostle Paul, believe, born again, Eternal Life, forgiveness, Hasidic, hell, Holy Spirit, hypocrite, Israel, Jerusalem, Jesus, Jimmy Carter, Law, life, Nick at Night, Nicodemus, Pharisee, salvation, Sanhedrin, sin, Spirit, unbeliever, wind. Bookmark the permalink.